The spine measures 26mm (1 inch) wide. The spine measures 32mm (1.25 inches) wide. The spine measures 39mm (1.5 inches) wide. Another collaboration between myself and Chris Nickle. 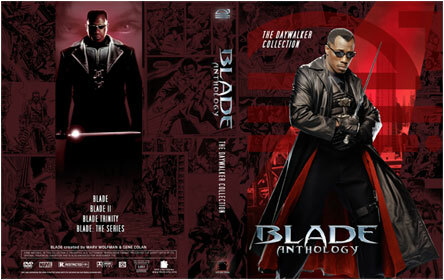 Realizing that some folks may have one or 2 disc versions of the movies, or may want to include Blade: The Series, there are several different variations for different size cases. There are even versions with no listingas on the back so that you can customize them to suit your needs. 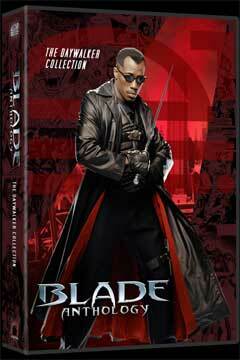 Below is an example of a cover for a 10 disc case. that includes the 3 feature films as well as the TV series. Click on the cover for a bigger view. To download a cover that works best for you, choose from the choices below.